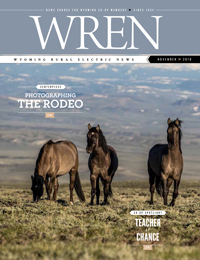 Wyoming Rural Electric News has the largest circulation of any Wyoming publication. Each month it combines articles on the safe and efficient use of electricity with agriculture, business and education features of interest to Wyoming residents. Statewide mailing includes circulation to state legislators, government offices, schools and libraries, comprising a readership of more than 98,000 monthly.